Are You Getting Your Internet Leads? We Are! MATTHEW CURCIO HAS AWARD WINNING YEAR! MATTHEW CURCIO OF RE/MAX PREFERRED HAS AWARD WINNING YEAR (Sewell, NJ) – Matthew Curcio, Sales Associate with RE/MAX Preferred in Sewell, was recently awarded membership to the RE/MAX Hall of Fame and was ranked 7th in the state for units sold out of over 3,000 RE/MAX Associates in New Jersey. Curcio is a Certified Distressed Property Expert (CDPE), and has been working with foreclosures and short sales for years. In 2009 he helped twelve South Jersey families avoid foreclosure on their homes. “I didn’t have to adapt to the changing market as much as other agents because distressed properties have always been a huge part of my business,” said Curcio. In 2009, 20% of Curcio’s business was distressed properties. To contact Matthew Curcio, call RE/MAX Preferred in Sewell at 856-589-4848, or log on to his website at www.SellingSJ.com or www.StopMyNJForeclosure.com. With over 80 agents and with branch offices throughout the South Jersey region, RE/MAX Preferred continues to be one of the leading real estate brokerages in the area. Since its inception in 2000, RE/MAX Preferred has continued to experience steady growth. This remarkable success is largely due to RE/MAX Preferred’s quality agents and dedication to service. RE/MAX Preferred is a privately owned and operated franchise of RE/MAX International. Please visit www.njpreferredhomes.com for more information. Editors: Please note RE/MAX is all caps. Start the year with a plan. Increase your business in 2009! Get Your 2009 Business Plan! Do you want to be in the Top 5%? Only 5% of real estate agents nationwide have a business plan. Prepare yourself for greatness! Dramatically increase your income and success. "You are surrounded by simple, obvious solutions that can dramatically increase your income, power, influence, and success." Now is the time to begin crunching the numbers, setting your income goals, developing your strategies and working on solutions. That's why we're offering you a free business plan to help give you a the best possible opportunity for success in 2009. As an added bonus, agents who submit their request before January 1st will receive a free Confidential Business Assessment. Once you have filled out this form, one of our leading industry experts will schedule a 30min business assessment appointment to personally discuss your current business and future strategies with you over the phone. Get Your Confidential Business Assessment! RE/MAX Preferred helps agents control the escalating cost of doing business. Broker/Owner of RE/MAX Preferred, Randel Jones, reports that, while the cost of selling real estate is sky rocketing, RE/MAX Preferred is working to help control costs for its agents. Many offices are continuing to increase their E&O expenses to their agents with upfront lumpsum payments of $600, $700, or even more. At RE/MAX Preferred, they are going against this trend by reducing costs and offering affordable payment plans. RE/MAX Preferred reduces agent E&O expenses. Through diligent research with various insurance companies, RE/MAX Preferred has been able to hold the cost on it's agents E&O expenses. Even more exciting, Broker/Owner Randel Jones has decided that the company will assist it's agents with their E&O expense by offering discounts and several low payment plan options. Take advantage of the options below and save! OPTION #1: Timely Payment Discount - Send in your payment by August 25th and pay a special reduced rate of $499 for your E&O Insurance! OPTION #2: Quarterly Payment Plan - Sign up for the quarterly payment plan and you will be billed $175/quarter. Sign up for automatic payment by credit/debit card and pay only $150/quarter! We're all facing challenges in this tightening market. Trying to pay your E&O insurance shouldn't be one of them! RE/MAX Preferred is always striving to support it's Preferred Agents in increasing their bottom lines. "When markets conditions change, we respond!" NEVER MISS A LEAD AGAIN! Automatically and Effortlessly Capture All Your RE/MAX Leads! 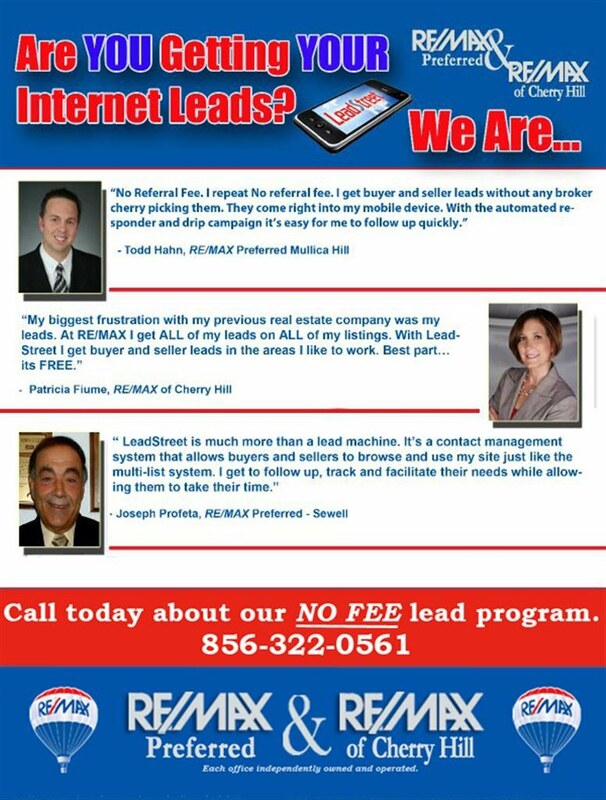 RE/MAX Preferred has just rolled out a new program that is designed to automatically accept your web leads! No more fumbling with text messages. No more missed leads due to responding too late. No more waking up in the middle of the night to accept leads! RE/MAX Preferred's Acceptance Program does all that for you, instantly. Whenever you get a web lead, our program will accept it for you. You will still receive emailed notification that the lead has been offered. This will be instantly followed up with a message that the lead has been accepted. All without pushing a button! SIGN UP TODAY! To participate in this valuable, time saving program, simply email your request to Thomasina at tcruz@njpreferredhomes.com and she will take care of the rest! Now I get all the leads 100% of the time and I've gotten at least two listings from it so far." "It works really well, I love it! I don't miss any leads now!" "This is definitely a benefit. No matter what time they go online, I get the lead, even if it's 3am and my phone is off! 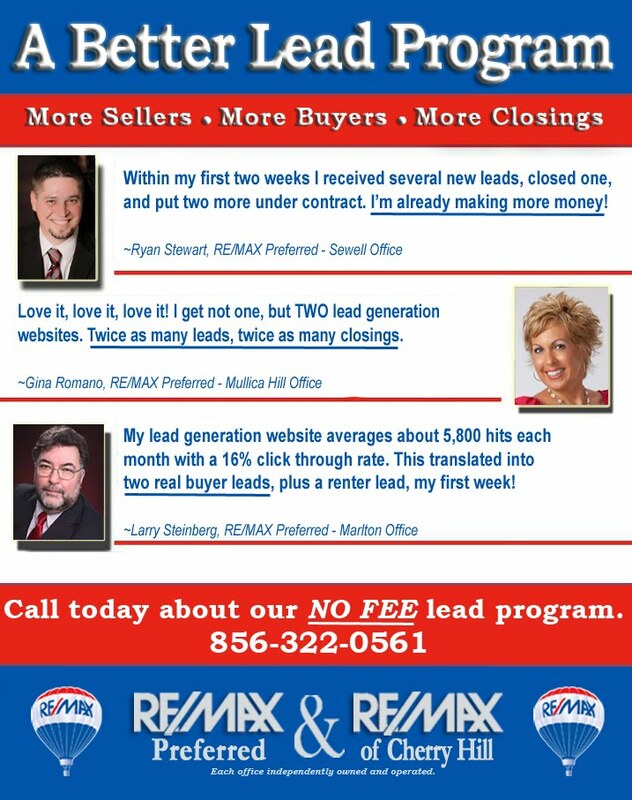 Thanks, RE/MAX Preferred, for no more missed leads!" "It's worked quite well for me. I don't use a blackberry and this allows me to an even playing field!" Fast Times at RE/MAX Preferred! RE/MAX Preferred is undergoing many positive changes, even under current market conditions! Let me share with you what we're currently doing here at RE/MAX Preferred. As you already know, we are still settling down from the exciting merger of RE/MAX Affiliates to RE/MAX Preferred in Sewell. We have many new agents, a great new location, and tons of positive energy and growth. I'd like to personally thank Lydia and Judy for putting their faith in RE/MAX Preferred and their vision of a greater company. Their support has been invaluable in helping to make our transition better than we could have imagined. As a result of this merger we've been able to transfer Karen back to our Mullica Hill office and I've heard nothing but good things about this change. Our agents in Mullica Hill continue to be "Above the Crowd". We've recently been informed by RE/MAX International that Todd Hahn may qualify for the RE/MAX Hall of Fame. Our Voorhees office has really come together in the last few months with great weekly meetings resulting in increased participation, creativity, and productivity. In fact, our Voorhees agents recently came up with the idea of hosting a barbeque in their office parking lot. Many agents attended and we had a great time talking about real estate and sharing stories! Recently, Jeremy Conner and his assistant Patty Scerati have joined our Voorhees office. 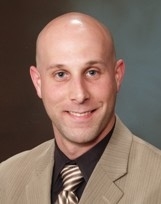 Jeremy is a former owner of RE/MAX Associates in Voorhees. He specializes in commercial real estate, which will bring a whole new area of expertise and add another dimension to RE/MAX Preferred as a commercial leader in the South Jersey market. Federation Title will be moving to our Marlton location, providing added convenience to our agents. Marlton will now become our official corporate office. It will remain available to all our agents for meeting with clients, having closings, and using the phones, computers, copier, and fax as it always has been in the past. The only difference is that all processing will now be done through our branch offices in Voorhees, Sewell, and Mullica Hill, as well as, our sister office, RE/MAX Suburban in Medford. Our purpose is to build up our branch offices, increase the number of agents, and create synergy. This will also have the added benefit of relieving me of the day-to-day duties of an office manager so that I can more fully concentrate on growing a better, stronger company for all of us. I will be coming up with new ideas, events, and programs that will benefit everyone and continue to help us all grow and succeed in this ever-changing real estate market.